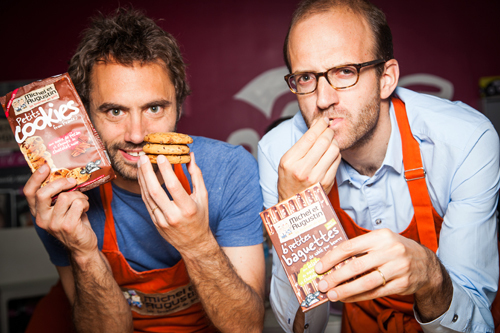 On today’s episode of THE FOOD SEEN, Augustin Paluel-Marmont, one half of “two kooky cookies“, better known as Michel et Augustin, brings his French flours to the US, to bake the most delicious sables and feuilletes aperitif (cookies & crackers). What began as a self taught fascination, turned into a passion project first about bread, going so far as publishing “Le Guide Des Boulangeries De Paris”, a Michelin guide for bakeries. Michel & Augustin then began using friends bakery spaces on their days off, perfecting filled shortbread squares, and selling them door to door. Now, they have a “banana farm” of over 100 employees, all of which are or will be pastry chefs. As a child he used to make Tarte Tropezienne with his grandmother, and now Augustin is on #SupersonicMission which will see their cookies go from being sold in 25 to 7624 Starbucks in the next few months. These cookies aren’t just for French bobos anymore!